The snows of Kilimanjaro may soon be gone. The African mountain's white peak — made famous by writer Ernest Hemingway — is rapidly melting, researchers report. Some 85 percent of the ice that made up the mountaintop glaciers in 1912 was gone by 2007, researchers led by paleoclimatologist Lonnie Thompson of Ohio State University report in Tuesday's edition of Proceedings of the National Academy of Sciences. And more than a quarter of the ice present in 2000 was gone by 2007. If current conditions continue "the ice fields atop Kilimanjaro will not endure," the researchers said. 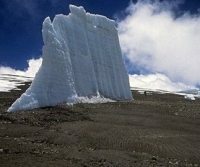 The Kilimanjaro glaciers are both shrinking, as the ice at their edges melts, and thinning, the researchers found. Similar changes are being reported at Mount Kenya and the Rwenzori Mountains in Africa and at glaciers in South America and the Himalayas. "The fact that so many glaciers throughout the tropics and subtropics are showing similar responses suggests an underlying common cause," Thompson said in a statement. "The increase of Earth's near surface temperatures, coupled with even greater increases in the mid- to upper-tropical troposphere, as documented in recent decades, would at least partially explain" the observations. Changes in cloudiness and snowfall may also be involved, though they appear less important, according to the study. On Kilimanjaro, the researchers said, the northern ice field thinned by 6.2 feet (1.9 meters) and the southern ice field by 16.7 feet (5.1 meters) between 2000 and 2007. Researchers compared the current area covered by the glaciers with maps of the glaciers based on photographs taken in 1912 and 1953 and satellite images from 1976 and 1989. The research was funded by the U.S. National Science Foundation and National Oceanic and Atmospheric Administration.